The original Hotel Montagu was a popular overnight stop with travelers wanting to rest their weary horses between Port Elizabeth and Cape Town on the old Route 62. At the charming Montagu Country Hotel, a tranquil and relaxing stay can be enjoyed. Tucked away in the Cape Winelands, the hotel is perfect for those wishing to escape the hustle and bustle of the city life. It is here where you can experience warm hospitality, indulge in rejuvenating spa treatments and explore the greater winelands. In the 1920s the 'Art Deco' design, largely initiated and inspired by Paris designers, also took off in South Africa, and the Montagu Hotel's present design is very much based on that period. The bar counter in the residence pub at this Cape Winelands country hotel is one of the best examples of art deco furniture that exists and is very unique. 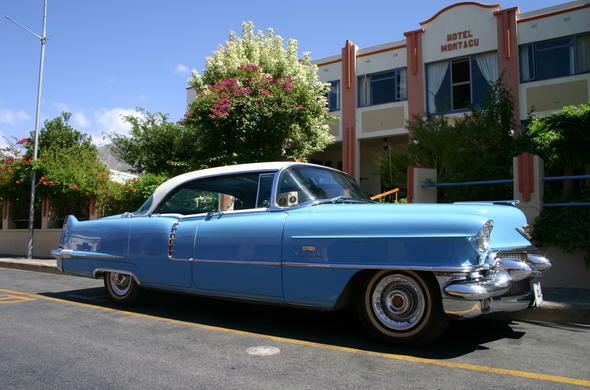 Unique Art Deco pieces can be seen in the comfortable accommodation and it blends in perfectly with life in Montagu. Roam the streets of Montagu to experience country living. There are many little shops in the area where biltong, dried fruit, nuts, homemade rusks and other delicacies can be purchased. Enjoy the sweeping views of authentic buildings and visit the steps of the church for a glorious view of the town. Montagu became famous for the healing hot water that rises to the surface in a stream of large bubbles - saturated with gases - since ancient days an indication that the water contains abundant minerals. At the Montagu Hotel, guests can experience the clear spring water, which is very soft and sweet smelling, during a soothing and relaxing mineral bath at the spa. Specialised spa treatments such as aromatherapy and deep tissue massages can be arranged. This Cape Winelands country hotel specializes in traditional cuisine complemented by top quality wines of the Robertson Wine Route area. The menu features delicious meals such as soup, lamb pie and pork belly. Unwind with golden oldies played on a Baby Grand, taking you on a nostalgic trip down memory lane. Four of the Luxury Rooms at the Montagu Country Hotel are in a Victorian villa built in 1905 in the garden behind the main hotel. The Montagu Country Hotel offers Classic and Luxury bedrooms, all en suite and with all modern facilities.